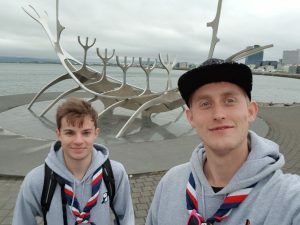 In July 2017, two members of the 23rd Bromley represented the UK Scouting at the World Scout Moot in Iceland. 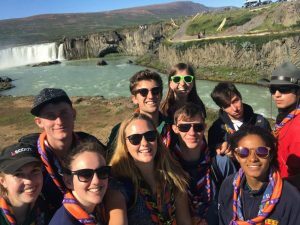 “Going to a Moot is like going on a strange family holiday to Iceland where your family (patrol) is made up of 10 people from multiple nationalities, and you stay with 3 other families of 10 to make up a tribe. I say family because over the course of the moot you become very close with your patrol, as you live, cook, eat, and do activities together. As well as organising yourselves and helping each other out. 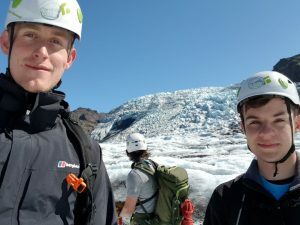 During the Moot, we had the opportunity to go and sightsee around Rekyjvick (the capital), travel around up to Akureyri (our activity centre) and Úlfljótsvatn (the main campsite). Throughout all of these places we were able to go hiking up mountains, visit hot pools and the naturally heated swimming pools, carry out community work at a farm, and visit geysers, craters and geothermal power plants. In addition there were endless amounts of games and smaller activities for us to get involved in at the campsites. During our stay at the main campsite in Úlfljótsvatn we took part in the international day, where we got to experience the cultures and traditions of different countries. Every country at the Moot had their own stall with food, games, information, art etc. The group of us from London had decided to dress up as tube stations and make it a challenge for people to go around and get a photo with 10 tube stations to win a prize. My experience in Iceland wasn’t just limited to the Moot. We wanted to make the most of our time in Iceland, so a couple of us spent a few days before and after Moot doing a couple of road trips along the South and West coasts. In the few days we managed to drive hundreds of kilometres through the beautiful landscapes of Iceland; climb a glacier; walk underneath and see 6 waterfalls including the massive Gullfoss waterfall; and visit the continental divide in Þingvellir National Park. Overall I had a fantastic time in Iceland, got to meet some great people and got a amazing experience or Iceland and the Moot.